For patients with obstructive sleep apnea, especially those using positive airway pressure devices, nasal breathing is crucial. If there is complete or near-complete nasal obstruction, patients on PAP will be forced to breathe through their mouths. Because of the intentional leak design of PAP masks, the high amount of air flow around the open mouth leads to severe and uncomfortable dry mouth. Simply put, even with full face masks, most, if not all, patients will need to breathe through their noses to use PAP therapy comfortably. In a large cohort study done by Young et al, nasal congestion was strongly associated with snoring, restless sleep, and excessive daytime sleepiness.1 The study also found that patients who had allergic rhinitis-related nasal congestions were 1.8 times more likely to have moderate to severe OSA than those without nasal congestion due to an allergy. The Pediatric Allergies in America survey in 2009 found that snoring was 2.8 times more likely in children with chronic rhinitis. Forty percent of parents of children with allergic rhinitis reported some sleep disruption compared with 7% without allergic rhinitis.2 Clearly, nasal congestion is detrimental to sleep and is of importance to sleep medicine. Nasal breathing is preferred over oral breathing for several reasons. With oral breathing, as the mouth opens, the jaw moves inferiorly and posteriorly. This positions the tongue closer to the posterior pharyngeal wall and narrows the airway significantly. Also, this leads to changes in the muscle fiber length-tension relationship of the genioglossus muscle, which effectively decreases its muscle tone and makes the upper airway more prone to collapse. In children, chronic mouth breathing leads to changes in the patterns of muscle activation in the facial muscles and to caudal growth of the maxilla and the appearance of a high-arched palate. Chronic mouth breathing often leads to bite abnormalities including underbite and cross bite. Oral breathing bypasses the nasal ventilation reflex, a reflex activation of the genioglossus muscle with nasal breathing that increases respiratory rate and minute ventilation in healthy people and which can be attenuated by anesthetizing the nose.3 Whereas breathing through the nose increases the minute ventilation and tidal volume. Because patients and their families are sometimes unaware that chronic mouth breathing is a problem—or that it can be corrected, sleep medicine physicians can easily do their patients a great service by doing a quick physical exam of the nose and face. A penlight is the only equipment needed. During your history questions, pay attention to whether the patient is breathing through their mouth. Dennie lines, also known as Dennie–Morgan folds, on the lower eyelid can be symptomatic of rhinitis. Become familiar with the “adenoidal facies;” in children in particular, this appearance is due to chronic mouth breathing. The movie character Napoleon Dynamite is an excellent example of the adenoidal face. Look for a slightly hyperpigmented line—known as the nasal crease—across the nose due to chronic wiping. Dark circles under the eyes from vasocongestion of the venous pools in the face, and Dennie lines on the lower eyelid can be seen in patients with chronic rhinitis. Pay attention to the shape of the nose. A crooked nose often indicates nasal septal deviation, a wide nose can indicate nasal turbinate hypertrophy. Narrow slit-like nares are often seen in nasal valve collapse. Ask the patient to inhale sharply through their nose and look for collapse of the nares. When you examine the oropharynx, ask the patient to look up and examine the hard palate. A high-arched palate and/or triangular maxillary arch is often seen in patients with chronic nasal congestion currently or in childhood. For patients with a structural abnormality like nasal septal deviation, surgical treatment is often the best approach. For nasal valve collapse, surgery is the definitive treatment, but it is also amenable to a variety of devices designed to support the nasal alar cartilage, like Breathe Right strips. If inflammation is the cause of the nasal obstruction, patients should be treated with one or more medications. The mainstay of treatment, and the one with the most supporting evidence, are nasal steroids. Nasal steroids have been shown to decrease the apnea-hypopnea index (AHI) in both adults and children and decrease mouth breathing.5-7 Leukotriene antagonists have also been shown to improve the symptoms of allergic rhinitis, and for these patients, it can be helpful. 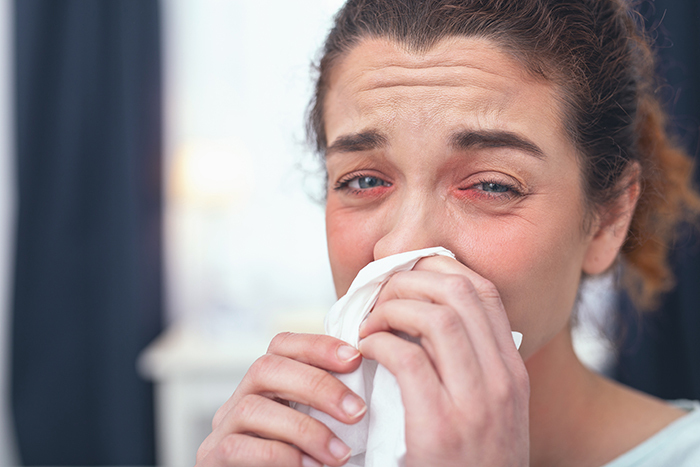 Antihistamines, both oral and nasal, may be helpful for rhinorrhea. Anticholinergic nasal sprays can also be helpful for some patients. Alpha-agonists are often sold without a prescription in the United States and can be very helpful for periodic nasal congestion. Oxymetazoline is a commonly used alpha-agonist spray that decreases nasal congestion in a dramatic fashion. Because frequent use can lead to increasing dependence on this medication to control nasal congestion and rhinorrhea (a condition called rhinitis medicamentosa), care should be taken with its use. Oral pseudoephedrine can also be effective and is sometimes combined with antihistamines to control rhinorrhea. Alpha-agonists are generally intended for short-term use, and clinicians should consider the possibility of worsening hypertension as a side effect of their use. For patients on CPAP, consider the possibility of growth of molds in the humidification chamber, which can cause nasal inflammation. Simply cleaning the chamber regularly can sometimes resolve this. Nasal breathing is critical to a good night’s sleep for all patients. Compared with oral breathing, nasal breathing decreases snoring and excessive daytime sleepiness. For patients with OSA, correcting chronic nasal obstruction due to structural or inflammatory problems is critical to use of PAP therapy and oral appliances. Chronic mouth breathing in children changes the shape of children’s faces and can lead to dental problems. Addressing nasal obstruction will significantly improve the quality of life or your patients, and sleep medicine professionals can play a critical role in treating this problem. 1. Young T, Finn L, Kim H. Nasal obstruction as a risk factor for sleep-disordered breathing. The University of Wisconsin Sleep and Respiratory Research Group. J Allergy Clin Immunol. 1997 Feb;99(2):S757-62. 2. Meltzer EO, Blaiss MS, Derebery MJ, et al. Burden of allergic rhinitis: results from the Pediatric Allergies in America survey. J Allergy Clin Immunol. 2009 Sep;124(3 Suppl):S43-70. 3. White DP, Cadieux RJ, Lombard RM, et al. The effects of nasal anesthesia on breathing during sleep. Am Rev Respir Dis. 1985 Nov;132(5):972-5. 4. Fitzpatrick MF, McLean H, Urton AM, et al. Effect of nasal or oral breathing route on upper airway resistance during sleep. Eur Respir J. 2003 Nov;22(5):827-32. 5. Kiely JL, Nolan P, McNicholas WT. Intranasal corticosteroid therapy for obstructive sleep apnoea in patients with co-existing rhinitis. Thorax. 2004 Jan;59(1):50-5. 6. McLean HA, Urton AM, Driver HS, et al. Effect of treating severe nasal obstruction on the severity of obstructive sleep apnoea. Eur Respir J. 2005 Mar;25(3):521-7. 7. Brouillette RT, Manoukian JJ, Ducharme FM, et al. Efficacy of fluticasone nasal spray for pediatric obstructive sleep apnea. J Pediatr. 2001 Jun;138(6):838-44.